Clamp makes a product designed for beauty and anime addict like me, an item I am sure I can never resist. Its a miniature Clow Card Box and Clow Wand makeup! 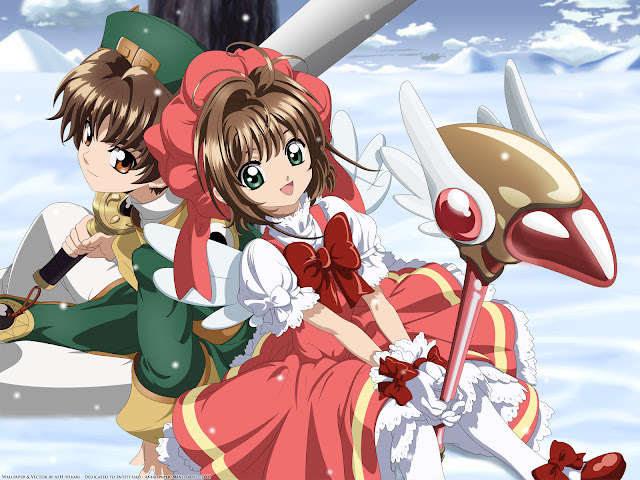 Do you know Card Captor Sakura? Its an anime hit, back when I was in College. She is a cute little girl collecting Clow Cards that has magic on it. Of course, who will also forget the cool Syaoran who is her partner in the story! I went to Hong Kong last January and while I was shopping at Sasa I passed by a shelf selling the Sailor Moon eyeliners and I saw this box (photo below) and it looked familiar. There are two boxes left and I have no idea what is included inside but when I looked around the shelf, there's a mirrored display on top and that is when I knew I got to have this. Its a Clow Card Blush and Clow Wand Lip Balm. Let me now share what I got in details. Product Description and Ingredients: (Written in Japanese Language) I tried looking for it online but there is no product preview found nor other reviews. I love how Clamp put an effort to get the details of the box of the cards. Actually in the anime, the box looks like a book but when Sakura first opened it, it actually consists of Clow Cards. No matter which side I look, this miniature box is an exact replica of the anime. The covering of the blush is a wax paper with the first card that Sakura found, its Windy. For a blush that looks like a toy, it is quite pigmented. Its sheer but two layers of application is enough to color my cheeks. The blush is pale pink and shimmery. It is easy to apply and blend. I did not experience any breakouts from the blush. If you are an anime and makeup addict like me, you will find joy with this set displayed on your vanity area. I don't know if I just can't read the Japanese language or the weight is not really indicated both on the blush or its box. The blush does not last long, it lasts for only two to three hours. Also, the blush smells a little like soap. Sakura's wand is actually a key necklace and when she wants to use it, the wand will get big. She uses this wand to control the cards. She calls it, "key". Clamp also copied this key perfectly. When I first got this, I thought that the lip balm is originally a lipstick. However upon opening, I learned that I am mistaken and its actually a balm. The balm stick looks pink but its colorless. It can moisturize my lips but it does not last long. The lip balm has a waxy taste. Its colorless so I can't wear the balm alone. Frequent re-application is needed to maintain the moisture. I used both the blush and the lip balm on this photo. Where to buy? Sasa, Hong Kong. I think its readily available in Japan stores.